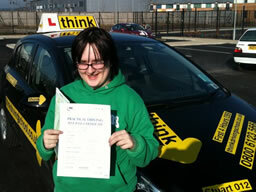 After having driving lessons with Cardiff think driving school instructor Dave Terrar, Well done Sia! After having Driving Lessons with Bordon Think Driving School Instructor Ian Weir. Well Done Becky! 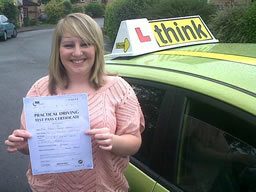 Becky was recommended to Think Driving School from most of her friends who had already passed their driving test with Ian Weir from Think Driving School. 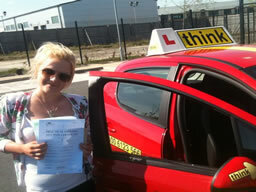 After having driving lessons with Cardiff think driving school instructor Dave Terrar, Well done Maria! 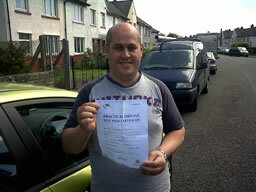 After having driving lessons with Cardiff think driving school instructor Dave Terrar, Well done Mike! 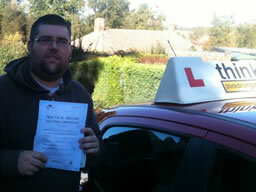 After having driving lessons with Sandhurst think driving school instructor Adam Iliffe. Well done Ram! After having Driving Lessons with Bordon Think Driving School Instructor Ian Weir. Well Done Siobhan! 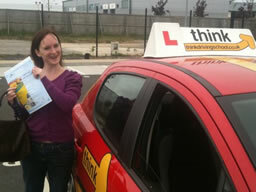 Siobhan was recommended to Think Driving School from most of her friends who had already passed their driving test with Ian Weir from Think Driving School. 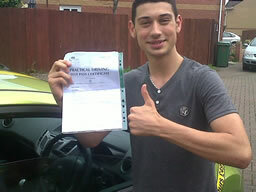 After having driving lessons with Aldershot think driving school instructor Stuart Webb, Well done Will! Will was recommended to Think Driving School from friends who had already passed their driving test with Stuart Webb from Think Driving School. After having Driving Lessons with Bordon Think Driving School Instructor Doug Edwards. Well Done Charlotte! 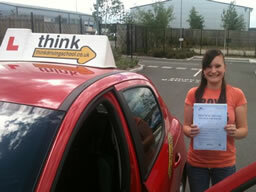 Charlotte was recommended to Think Driving School from a friend who had already passed their driving test with Doug Edwards from Think Driving School. 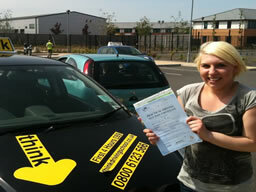 Danielle from Bracknell (191), PASSED FIRST TIME at Aldershot/Farnborough test centre on June 29th 2011. 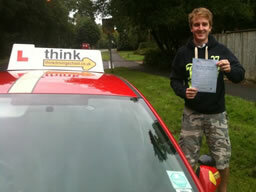 After having driving lessons with Sandhurst think driving school instructor Adam Iliffe. Well done Danielle! 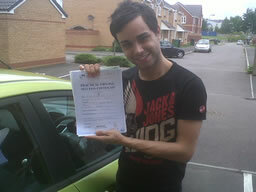 After having driving lessons with Aldershot think driving school instructor Stuart Webb, Well done Juan! Juan was Recommended to Think Driving School from friends who had already passed their driving test with Stuart Webb from Think Driving School. 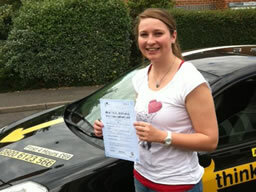 Charlotte from Bracknell (189), PASSED FIRST TIME at Aldershot/Farnborough test centre on July 11th 2011. 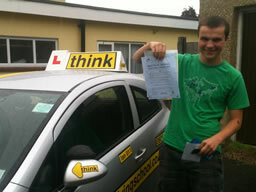 After having driving lessons with Sandhurst think driving school instructor Adam Iliffe. Well done Charlotte! 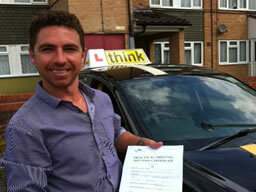 After having driving lessons with Sandhurst think driving school instructor Adam Iliffe. Well done Matt! 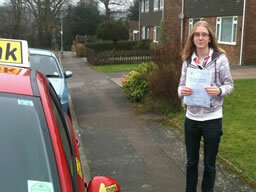 After having driving lessons with Aldershot think driving school instructor Wendy, Well done James! 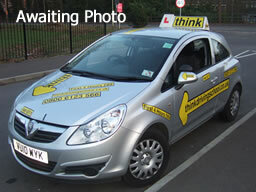 After having Driving Lessons with Guildford Think Driving School Instructor Ross Dunton. Well Done Daniel! After having Driving Lessons with Bordon Think Driving School Instructor Ian Weir. Well Done Shane! After having Driving Lessons with Bordon Think Driving School Instructor Ian Weir. Well Done Paul! Paul was recommended to Think Driving School from most of his friends who had already passed their driving test with Ian Weir from Think Driving School. After having Driving Lessons with Bordon Think Driving School Instructor Doug Edwards. Well Done Zoe! After having Driving Lessons with Bordon Think Driving School Instructor Doug Edwards. Well Done Rosie! 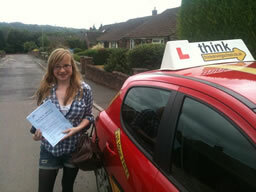 Rosie was recommended to Think Driving School from a friend who had already passed their driving test with Doug Edwards from Think Driving School. 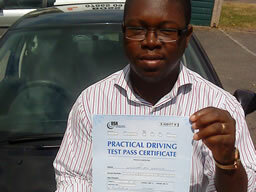 Zaffryn from Camberley (181), PASSED FIRST TIME at Aldershot/Farnborough test centre on July 4th 2011. 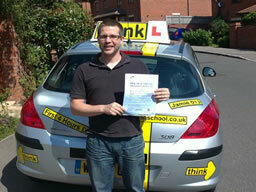 After having driving lessons with Sandhurst think driving school instructor Adam Iliffe. Well done Zaffryn! 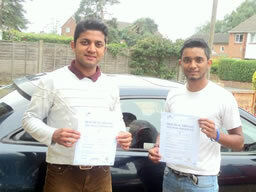 Brothers Sing and Jag from Farnborough (179/180), Both PASSED FIRST TIME at Aldershot/Farnborough test centre on June 30th 2011. 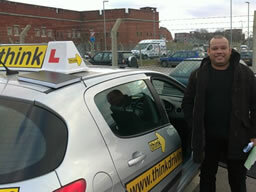 After having driving lessons with Sandhurst think driving school instructor Pete Labrum. Well done Boys! 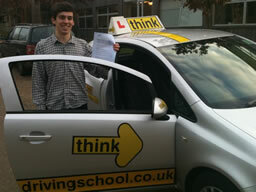 After having Driving Lessons with Guildford Think Driving School Instructor Ross Dunton. Well Done Shankar! 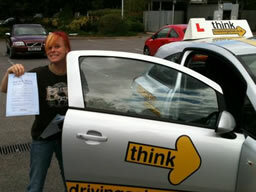 Danielle from Bracknell (177), PASSED FIRST TIME at Aldershot/Farnborough test centre on June 29th 2011. 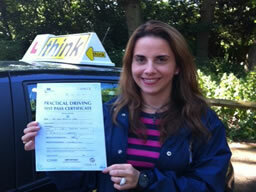 Lucia from Ascot (176), PASSED FIRST TIME at Chertsey test centre on June 29th 2011. 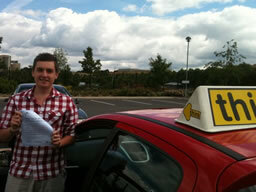 After having driving lessons with Sandhurst think driving school instructor Adam Iliffe. Well done Lucia! 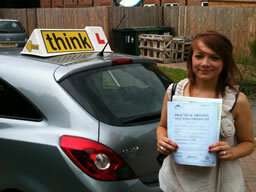 Libby was having lessons with a national driving school, but was not happy with them so she tried www.thinkdrivingschool.co.uk and passed within weeks after having Driving Lessons with Bordon Think Driving School Instructor Ian Weir. Well Done Libby! 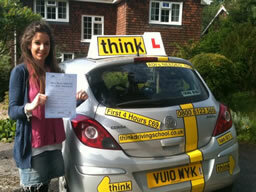 After having Driving Lessons with Bordon Think Driving School Instructor Ian Weir. Well Done Libby! 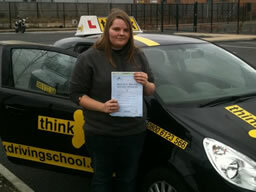 Libby was recommended to Think Driving School from a friend who had already passed their driving test with Ian Weir from Think Driving School. After having Driving Lessons with Think Driving School Instructors Stuart Webb and Doug Edwards. Well Done Girls! They where both recommended to Think Driving School from a friend who had already passed their driving test Think Driving School. After having Driving Lessons with Bordon Think Driving School Instructor Doug Edwards. Well Done Ashton! Ashton was recommended to Think Driving School from a friend who had already passed their driving test with Doug Edwards from Think Driving School. 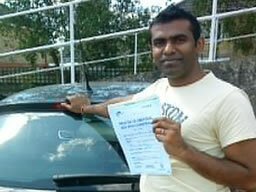 After having driving lessons with Cardiff think driving school instructor Dave Terrar, Well done Abdul! 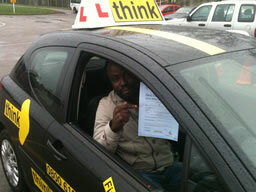 Agim from Camberley (170), PASSED FIRST TIME on June 21st 2011. 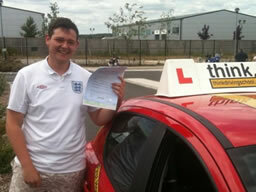 After having driving lessons with Sandhurst think driving school instructor Adam Iliffe. Well done Agim! 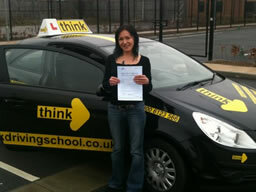 Claudia from Bordon (169), PASSED FIRST TIME at Guildford test centre on June 20ht 2011. 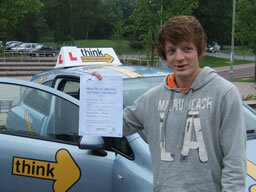 After having driving lessons with Bordon think driving school instructor Jamie Johnson. Well done Claudia! 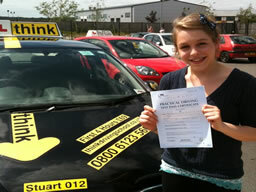 After having Driving Lessons with Bordon Think Driving School Instructor Ian Weir. Well Done Georgina! 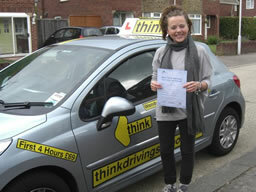 Georgina was recommended to Think Driving School from a friend who had already passed their driving test with Ian Weir from Think Driving School. 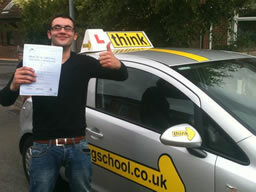 After having driving lessons with Aldershot think driving school instructor Stuart Webb, Well done Florian! Florian was recommended to Think Driving School from friends who had already passed their driving test with Stuart Webb from Think Driving School. 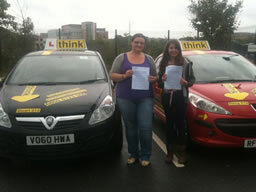 After having driving lessons with Aldershot think driving school instructor Wendy, Well done Laura! After having Driving Lessons with Bordon Think Driving School Instructor Ian Weir. Well Done Rob! Rob was recommended to Think Driving School from a friend who had already passed their driving test with Ian Weir from Think Driving School. 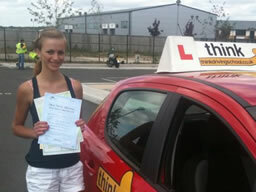 Elana from Liphook (163), PASSED at Aldershot/Farnborough test centre on June 13th 2011. 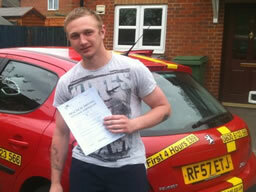 After having driving lessons with Bordon Think Driving School Instructor Jamie Johnson. Well done Elana! 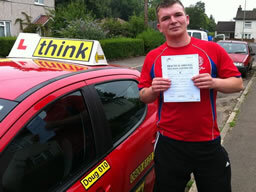 Adam had failed 3 time with a national driving school but passed on his first atempt with www.thinkdrivingschool.co.uk after having Driving Lessons with Bordon Think Driving School Instructor Ian Weir. Well Done Adam! After having Driving Lessons with Bordon Think Driving School Instructor Ian Weir. Well Done Adam! Adam was recommended to Think Driving School from a friend who had already passed their driving test with Ian Weir from Think Driving School. 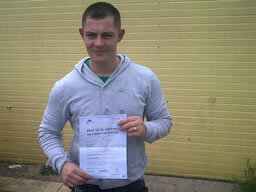 After having driving lessons with Aldershot think driving school instructor Stuart Webb, Well done Randy! Randy was recommended to Think Driving School from friends who had already passed their driving test with Stuart Webb from Think Driving School. 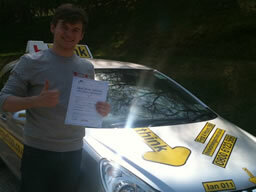 After having Driving Lessons with Camberley Think Driving School Instructor Tim Price-Bowen. Well Done Lucy! After having Driving Lessons with Bordon Think Driving School Instructor Ian Weir. Well Done Tamsin! 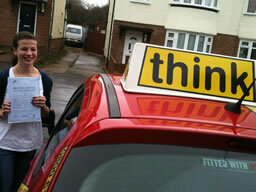 Tamsin was recommended to Think Driving School from her sisterwho had already passed their driving test with Ian Weir from Think Driving School a couple of years ago. After having Driving Lessons with Bordon Think Driving School Instructor Ian Weir. Well Done Jack! 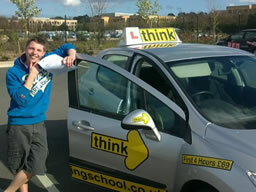 Jack was recommended to Think Driving School from a friend who had already passed their driving test with Ian Weir from Think Driving School. 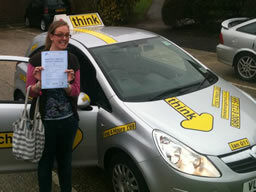 After having driving lessons with Aldershot think driving school instructor Stuart Webb, Well done Sarah! 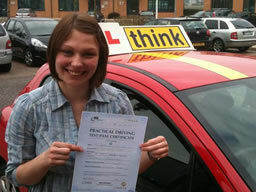 Sarah was recommended to Think Driving School from friends who had already passed their driving test with Stuart Webb from Think Driving School. 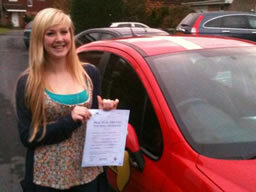 After having driving lessons with Aldershot think driving school instructor Stuart Webb, Well done Ellie! 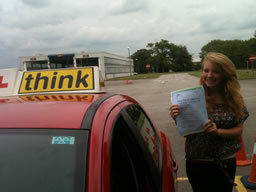 Ellie was recommended to Think Driving School from friends who had already passed their driving test with Stuart Webb from Think Driving School. After having Driving Lessons with Bordon Think Driving School Instructor Ian Weir. Well Done Dan! Dan was recommended to Think Driving School from a friend who had already passed their driving test with Ian Weir from Think Driving School. 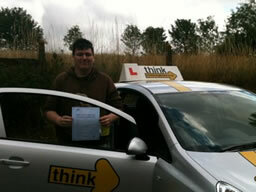 After having driving lessons with Cardiff think driving school instructor Dave Terrar, Well done Carl! 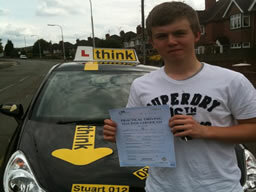 After having driving lessons with Aldershot think driving school instructor Stuart Webb, Well done Liam! 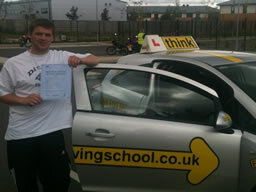 Liam was recommended to Think Driving School from friends who had already passed their driving test with Stuart Webb from Think Driving School. After having Driving Lessons with Bordon Think Driving School Instructor Doug Edwards. Well Done Katie! 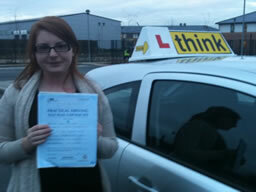 Katie was recommended to Think Driving School from a friend who had already passed their driving test with Doug Edwards from Think Driving School. 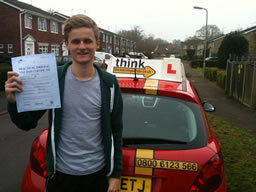 After having Driving Lessons with Guildford Think Driving School Instructor Ross Dunton. Well Done Brett! Brett was recommended to Think Driving School from a friend who had already passed their driving test with Ross from Think Driving School. After having Driving Lessons with Bordon Think Driving School Instructor Doug Edwards. Well Done Henry! Henry was recommended to Think Driving School from a friend who had already passed their driving test with Doug Edwards from Think Driving School. 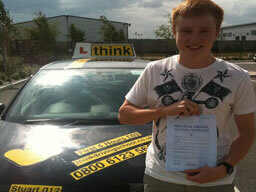 After having driving lessons with Bordon think driving school instructor Jamie Johnson. Well done Alice! After having Driving Lessons with Bordon Think Driving School Instructor Ian Weir. Well Done Amanda! 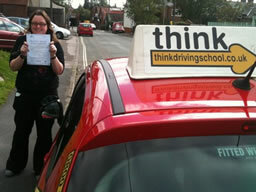 Amanda was recommended to Think Driving School from a friend who had already passed their driving test with Ian Weir from Think Driving School. After having Driving Lessons with Bordon Think Driving School Instructor Doug Edwards. Well Done Jonathan! Jonathan was recommended to Think Driving School from a friend who had already passed their driving test with Doug Edwards from Think Driving School. 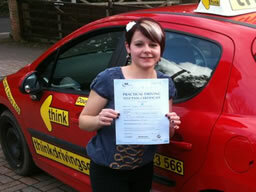 After having driving lessons with Aldershot think driving school instructor Stuart Webb, Well done Maxine! 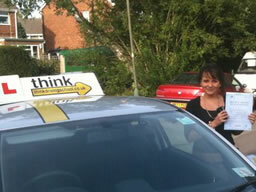 Maxine was recommended to Think Driving School from friends who had already passed their driving test with Stuart Webb from Think Driving School. 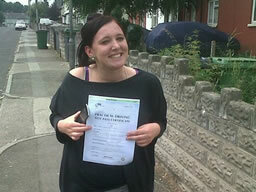 After having driving lessons with Aldershot think driving school instructor Stuart Webb, Well done Naomi! 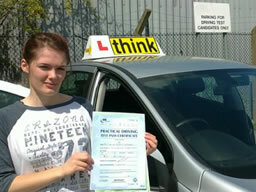 Naomi was recommended to Think Driving School from friends who had already passed their driving test with Stuart Webb from Think Driving School. After having Driving Lessons with Bordon Think Driving School Instructor Doug Edwards. Well Done Mitchell! Mitchell was recommended to Think Driving School from a friend who had already passed their driving test with Doug Edwards from Think Driving School. After having Driving Lessons with Bordon Think Driving School Instructor Doug Edwards. Well Done Josh! After having Driving Lessons with Bordon Think Driving School Instructor Ian Weir. Well Done Tamzin! 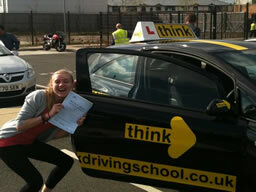 Tamzin was recommended to Think Driving School from a friend who had already passed their driving test with Ian Weir from Think Driving School. After having Driving Lessons with Bordon Think Driving School Instructor Ian Weir. Well Done Lisa! 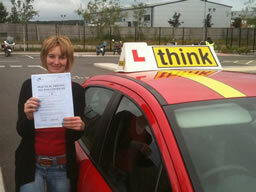 Lisa was recommended to Think Driving School from a friend who had already passed their driving test with Ian Weir from Think Driving School. 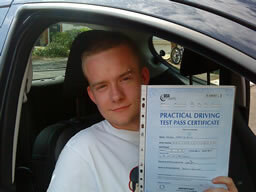 David from Aldershot (139), PASSED FIRST TIME on May 4th 2011. 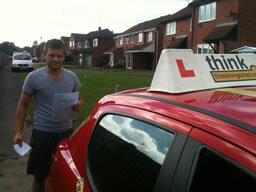 After having driving lessons with Sandhurst think driving school instructor Adam Iliffe. Well done David! After having Driving Lessons with Bordon Think Driving School Instructor Ian Weir. Well Done Charlotte! 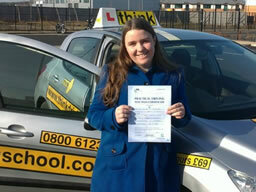 Charlotte was recommended to Think Driving School from a friend who had already passed their driving test with Ian Weir from Think Driving School. 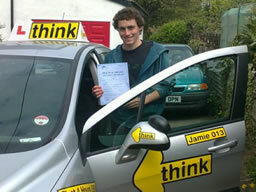 After having driving lessons with Bordon think driving school instructor Jamie Johnson. Well done Chris! Chris was recommended to Think Driving School from a friend who had already passed their driving test with Ian Weir from Think Driving School. After having Driving Lessons with Bordon Think Driving School Instructor Ian Weir. Well Done will! Will was recommended to Think Driving School from a friend who had already passed their driving test with Ian Weir from Think Driving School. 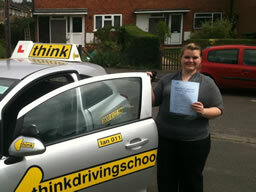 After having Driving Lessons with Bordon Think Driving School Instructor Ian Weir. Well Done Lizzy! 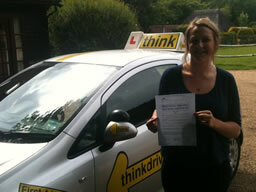 Lizzy was recommended to Think Driving School from a friend who had already passed their driving test with Ian Weir from Think Driving School. 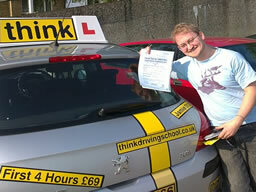 After having Driving Lessons with Guildford Think Driving School Instructor Ross Dunton. Well Done Naveen! 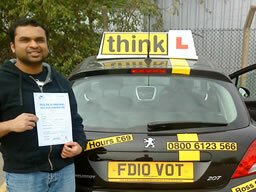 Naveen was recommended to Think Driving School from a friend who had already passed their driving test with Ross from Think Driving School. 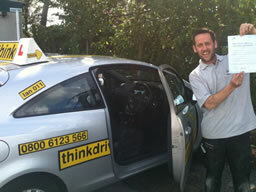 After having Driving Lessons with Guildford Think Driving School Instructor Ross Dunton. 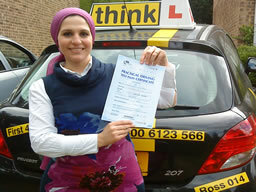 Well Done Nermine! 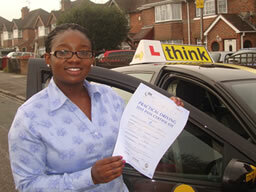 After having Driving Lessons with Bordon Think Driving School Instructor Doug Edwards. Well Done Rosini! 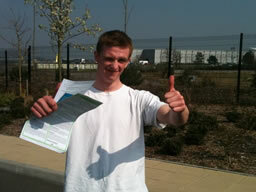 Peter from Altoon (131), PASSED FIRST TIME at Aldershot/Farnborough test centre on April 15th 2011. 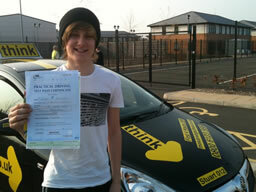 After having driving lessons with Bordon think driving school instructor Jamie Johnson. Well done Peter! 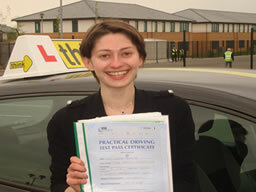 Oxana from Moscow (near Fulham (130), PASSED FIRST TIME on April 14th 2011. 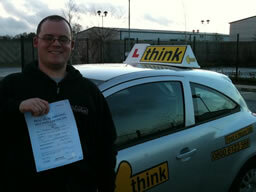 After having driving lessons with Sandhurst think driving school instructor Adam Iliffe. Well done Oxana! 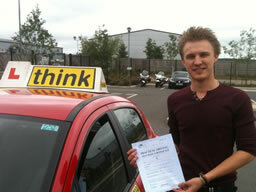 Nick from Farnham (129), PASSED FIRST TIME at Aldershot/Farnborough test centre on April 14th 2011. 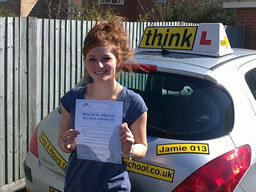 After having driving lessons with Bordon think driving school instructor Jamie Johnson. Well done Nick! Nick was recommended to Think Driving School from a friend who had already passed their driving test with Jamie Johnson from Think Driving School. After having Driving Lessons with Bordon Think Driving School Instructor Ian Weir. Well Done Robin! 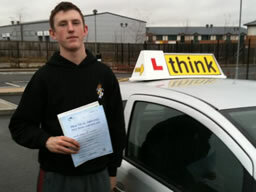 Jack was recommended to Think Driving School from his brothers who had already passed their driving test with Ian Weir from Think Driving School. After having Driving Lessons with Bordon Think Driving School Instructor Doug Edwards. Well Done Aaron! 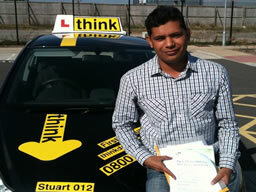 After having Driving Lessons with Aldershot Think Driving School Instructor Stuart Webb. Well Done Amanda! 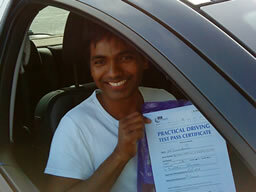 Chris from Crowthorne (125), PASSED FIRST TIME on April 12th 2011. 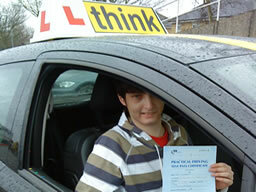 After having driving lessons with Sandhurst think driving school instructor Adam Iliffe. Well done Chris! 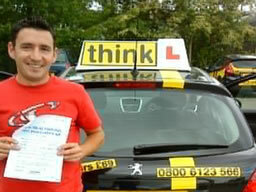 After having driving lessons with Aldershot think driving school instructor Stuart Webb, Well done Yoglander! 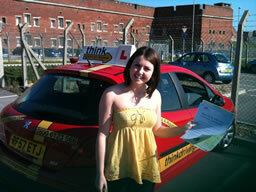 Ellie from Bordon (122), PASSED FIRST TIME at Aldershot/Farnborough test centre on April 9th 2011. After having driving lessons with Bordon think driving school instructor Doug Edwards. Well done Ellie! 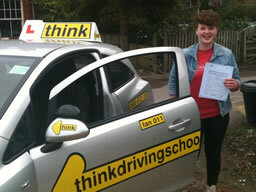 Ellie was recommended to Think Driving School from her brother who had already passed their driving test with Doug Edwards from Think Driving School. 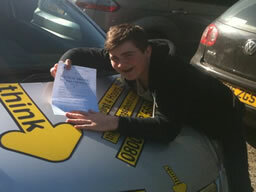 Jack was recommended to Think Driving School from his brother who had already passed their driving test with Ian Weir from Think Driving School. 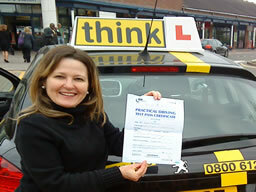 After having Driving Lessons with Camberley Think Driving School Instructor Tim Price-Bowen. Well Done Emma! After having Driving Lessons with Bordon Think Driving School Instructor Ian Weir. Well Done Jessica! 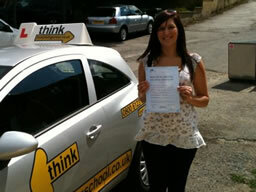 Jessica was recommended to Think Driving School from a friend who had already passed their driving test with Ian Weir from Think Driving School. 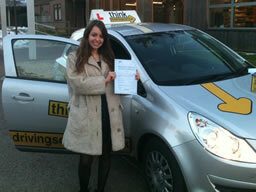 After having driving lessons with Aldershot think driving school instructor Stuart Webb, Well done Marta! 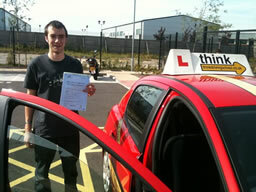 Ryan from Bordon (117), PASSED at Aldershot/Farnborough test centre on April 5th 2011. 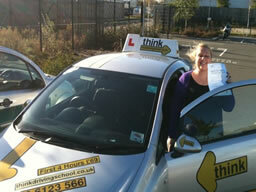 After having driving lessons with Bordon think driving school instructor Jamie Johnson. Well done Ryan! 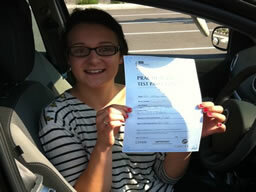 Ryan was recommended to Think Driving School from her sister who had already passed their driving test with Jamie Johnson from Think Driving School. 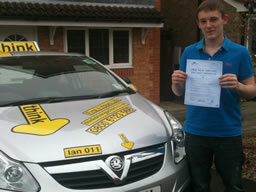 After having Driving Lessons with Aldershot Think Driving School Instructor Ian Weir. Well Done Liam! After having Driving Lessons with Bordon Think Driving School Instructor Ian Weir. Well Done Grace! After having Driving Lessons with Bordon Think Driving School Instructor Ian Weir and Stuart Webb. Well Done Nick! Nick was recommended to Think Driving School from a friend who had already passed their driving test with Ian Weir from Think Driving School. After having Driving Lessons with Bordon Think Driving School Instructor Ian Weir. Well Done Hannah! 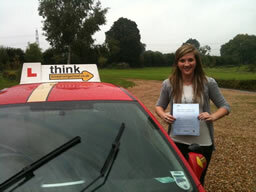 Hannah was recommended to Think Driving School from a friend who had already passed their driving test with Ian Weir from Think Driving School. After having Driving Lessons with Bordon Think Driving School Instructor Ian Weir. Well Done Francesca! 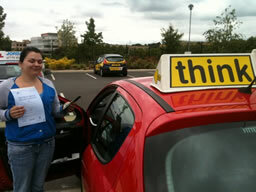 Francesca was recommended to Think Driving School from a friend who had already passed their driving test with Ian Weir from Think Driving School. 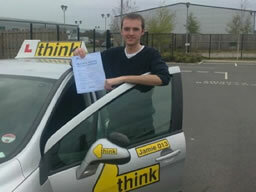 After having driving lessons with Aldershot think driving school instructor Stuart Webb, Well done Rob! Rob was recommended to Think Driving School from friends who had already passed their driving test with Ian Weir from Think Driving School. 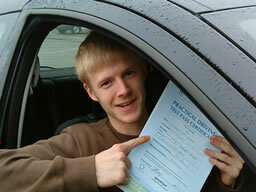 Joe from alton (109), PASSED FIRST TIME at Aldershot/Farnborough test centre on March 24th 2011. After having driving lessons with Bordon think driving school instructor Doug Edwards. Well done Joe! Joe was recommended to Think Driving School from His friend who had already passed their driving test with Doug Edwards from Think Driving School. 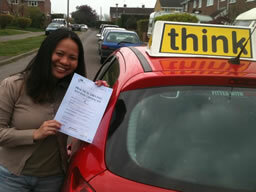 Elizabeth from Reading (108), PASSED FIRST TIME at Reading test centre on March 24th 2011. 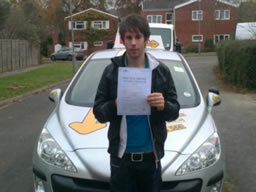 After having driving lessons with Sandhurst think driving school instructor Adam Iliffe. Well done Elizabeth! 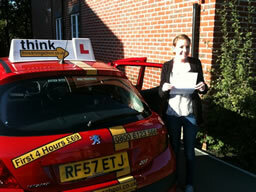 Lucy from Liphook (107), PASSED at Aldershot/Farnborough test centre on March 23rd 2011. 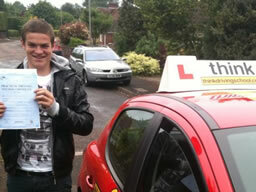 After having driving lessons with Bordon think driving school instructor Jamie Johnson. Well done Lucy! 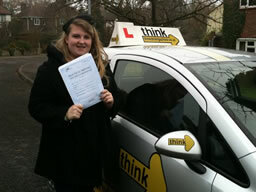 Lucy was recommended to Think Driving School from her sister who had already passed their driving test with Ian Weir from Think Driving School. 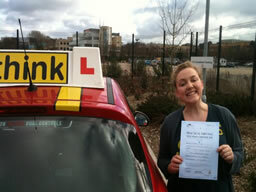 Poppy from alton (106), PASSED FIRST TIME at Aldershot/Farnborough test centre on March 22nd 2011. After having driving lessons with Bordon think driving school instructor Doug Edwards. Well done Poppy! 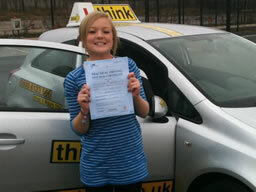 Poppy was recommended to Think Driving School from her brother who had already passed their driving test with Ian Weir from Think Driving School. 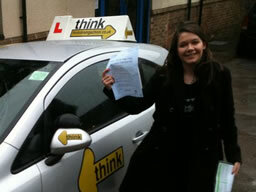 After having Driving Lessons with Aldershot Think Driving School Instructors Stuart Webb and Ian Weir. Well Done Sarah! 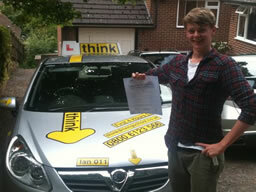 After having Driving Lessons with Guildford Think Driving School Instructor Ross Dunton. Well Done Leonardo! 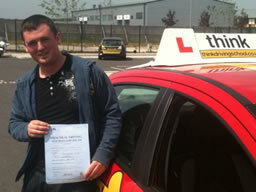 After having Driving Lessons with Aldershot Think Driving School Instructor Stuart Webb. Well Done Alihan! After having Driving Lessons with Bordon Think Driving School Instructor Doug Edwards. Well Done Hannah! After having Driving Lessons with Bordon Think Driving School Instructor Doug Edwards. Well Done Beth! After having a Driving Lesson with Bordon Think Driving School Instructor Ian Weir. Well Done Leigh! After having Driving Lessons with Bordon Think Driving School Instructor Ian Weir. Well Done Beth! 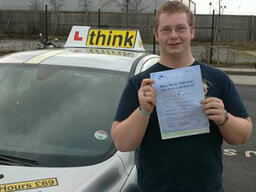 After having Driving Lessons with Aldershot Think Driving School Instructor Stuart Webb. Well Done Ashley! After having Driving Lessons with Bordon Think Driving School Instructor Doug Edwards. Well Done Kate! 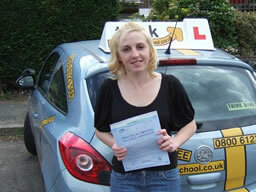 After having Driving Lessons with Bordon Think Driving School Instructor Ian Weir. Well Done Lauren! 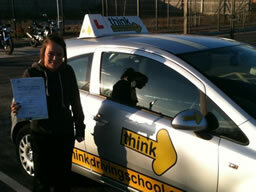 Lauren was recommended to Think Driving School from a friend who had already passed their driving test with Ian Weir from Think Driving School. After having Driving Lessons with Bordon Think Driving School Instructor Ian Weir. Well Done Edd! 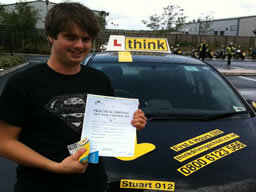 After having Driving Lessons with Aldershot Think Driving School Instructor Stuart Webb. Well Done Rob! 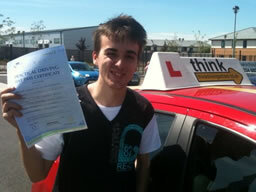 After having Driving Lessons with Guildford Think Driving School Instructor Ross Dunton. Well Done Shanthi! 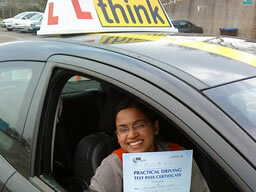 Shanthi was recommended to Think Driving School from her husband who had already passed their driving test with Ross Dunton from Think Driving School. After having Driving Lessons with Bordon Think Driving School Instructor Doug Edwards. Well Done Becky! 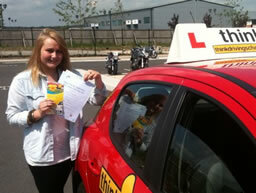 After having driving lessons with Aldershot think driving school instructor Stuart Webb, Well done Chloe! 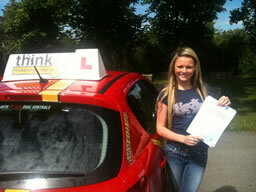 Chloe was recommended to Think Driving School from a friend who had already passed their driving test with Ian Weir from Think Driving School. 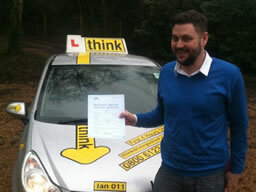 After having Driving Lessons with Camberley Think Driving School Instructor Tim Price-Bowen. Well Done Samantha! After having Driving Lessons with Bordon Think Driving School Instructor Doug Edwards. Well Done Hayley! 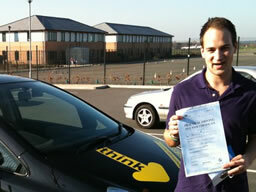 After having Driving Lessons with Camberley Think Driving School Instructor Tim Price-Bowen. Well Done Felix! 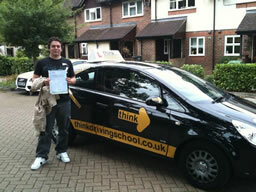 After having Driving Lessons with Guildford Think Driving School Instructor Ross Dunton. Well Done Jack! Jack was recommended to Think Driving School from a friend who had already passed their driving test with Ross Dunton from Think Driving School. After having Driving Lessons with Bordon Think Driving School Instructor Ian Weir. Well Done Chriss! 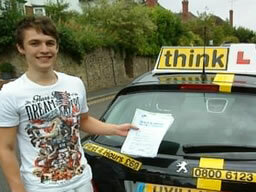 After having Driving Lessons with Guildford Think Driving School Instructor Ross Dunton. Well Done Lolo! Lolo was recommended to Think Driving School from a friend who had already passed their driving test with Ross Dunton from Think Driving School. After having Driving Lessons with Bordon Think Driving School Instructor Ian Weir. Well Done Lucy! 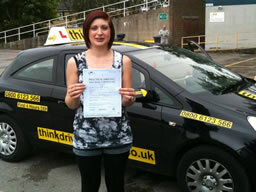 Lucy was recommended to Think Driving School from a friend who had already passed their driving test with Ian Weir from Think Driving School. 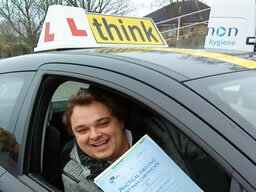 After having Driving Lessons with Camberley Think Driving School Instructor Tim Price-Bowen. Well Done Danielle! 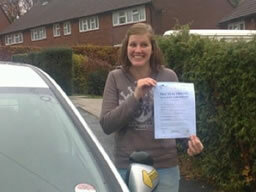 Rachel from Bordon, PASSED FIRST TIME at Aldershot/Farnborough test centre on Febuary 3rd 2011. 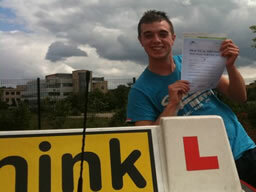 After having driving lessons with Bordon think driving school instructor Jamie Johnson. Well done Rachel! 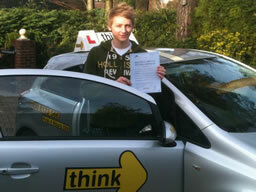 After having Driving Lessons with Guildford Think Driving School Instructor Ross Dunton. Well Done Marie! 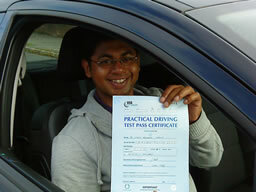 Arun from Hindhead, PASSED FIRST TIME at Portsmouth test centre on January 28th 2011. 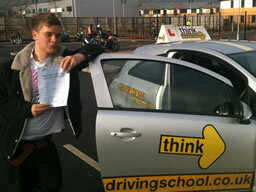 After having driving lessons with Bordon think driving school instructor Jamie Johnson. Well done Arun! 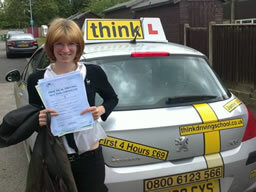 After having Driving Lessons with Guildford Think Driving School Instructor Ross Dunton. Well Done Ethan! Ethan was recommended to Think Driving School from his cousin who had already passed their driving test with Ross Dunton from Think Driving School. After having Driving Lessons with Bordon Think Driving School Instructor Ian Weir. Well Done Ned! 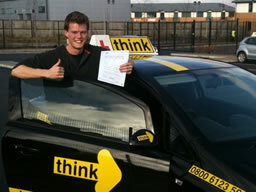 Ned was recommended to Think Driving School from a friend who had already passed their driving test with Ian Weir from Think Driving School. 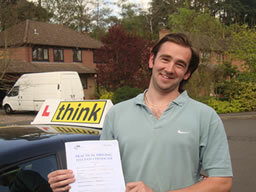 After having Driving Lessons with Camberley Think Driving School Instructor Tim Price-Bowen. Well Done Beta! 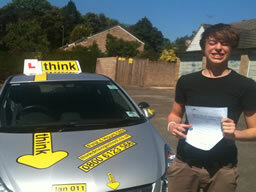 After having Driving Lessons with Guildford Think Driving School Instructor Ross Dunton. Well Done Suraj! Suraj was recommended to Think Driving School from his Friend who had already passed their driving test with Ross Dunton from Think Driving School. 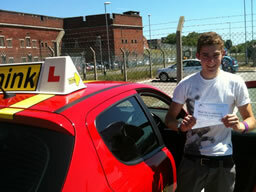 After having Driving Lessons with Aldershot Think Driving School Instructor Stuart Webb. Well Done Rosie! 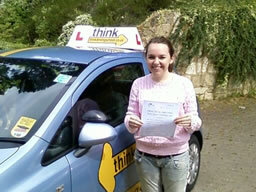 Rosie was recommended to Think Driving School from a friend who had already passed their driving test with Stuart Webb from Think Driving School. 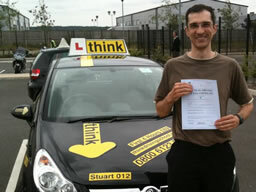 After having Driving Lessons with Aldershot Think Driving School Instructor Stuart Webb. Well Done Russ! 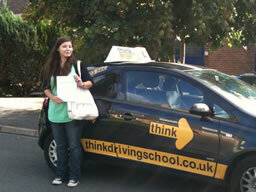 After having Driving Lessons with Guildford Think Driving School Instructor Ross Dunton. Well Done Steve! Steve was recommended to Think Driving School from his Friend who had already passed their driving test with Ross Dunton from Think Driving School. After having Driving Lessons with Bordon Think Driving School Instructor Doug Edwards. Well Done Emily! Emily was recommended to Think Driving School from his Friend who had already passed their driving test with Doug Edwards from Think Driving School. 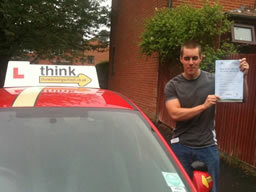 After having Driving Lessons with Aldershot Think Driving School Instructor Stuart Webb. Well Done Jordan! After having Driving Lessons with Bordon Think Driving School Instructor Ian Weir. Well Done Emma! 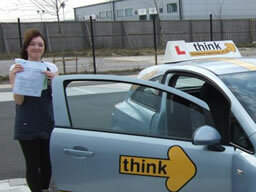 Emma was recommended to Think Driving School from a friend who had already passed their driving test with Ian Weir from Think Driving School. 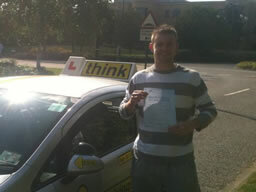 Matt from Medstead, PASSED FIRST TIME at Aldershot/Farnborough test centre on January 11th 2011. 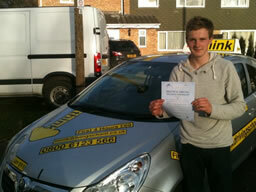 After having driving lessons with Bordon think driving school instructor Jamie Johnson. Well done Matt! 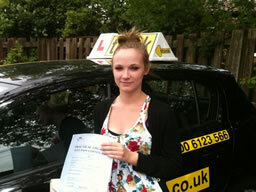 Rebecca from Headley, PASSED FIRST TIME at Guildford test centre on January 6th 2011, and only 2 Driver Faults (minors)! After having Driving Lessons with Bordon Think Driving School Instructor Ian Weir. Well Done Rebecca! Rebacca was recommended to Think Driving School from a friend who had already passed their driving test with Ian Weir from Think Driving School. 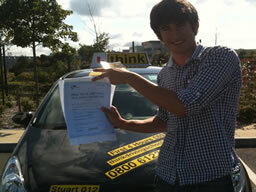 After having Driving Lessons with Guildford Think Driving School Instructor Ross Dunton. Well Done Ramesh! 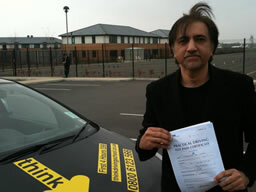 Ramesh was recommended to Think Driving School from his Friend who had already passed their driving test with Ross Dunton from Think Driving School. After having Driving Lessons with Bordon Think Driving School Instructor Doug Edwards. Well Done Christopher! Stuart from Grayshot, PASSED FIRST TIME at Farnborough/Aldershot test centre on December 14th 2010, and only 7 Driver Faults (minors)! After having Driving Lessons with Bordon Think Driving School Instructor Ian Weir. Well Done Stuart! 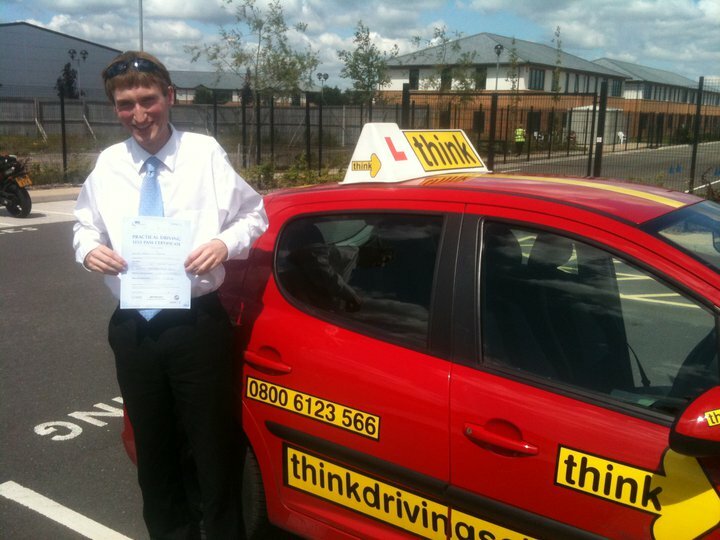 Stuart was recommended to Think Driving School from his brother who had already passed their driving test with Ian Weir from Think Driving School. 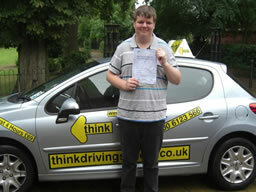 After having Driving Lessons with Guildford Think Driving School Instructor Ross Dunton. Well Done Pratap! 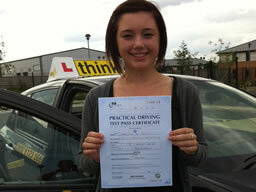 Olivia from Petersfield, PASSED FIRST TIME at Portsmouth test centre on December 13th 2010, and only 5 Driver Faults (minors)! After having Driving Lessons with Bordon Think Driving School Instructor Ian Weir. Well Done Olivia! 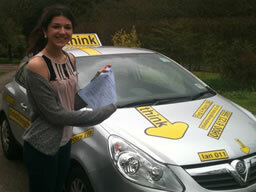 Olivia was recommended to Think Driving School from a friend who had already passed their driving test with Ian Weir from Think Driving School. 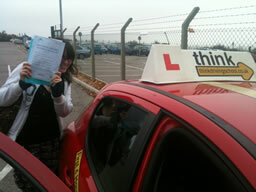 Hollie from Mychett (60), PASSED at Farnborough/Aldershot test centre on December 11th 2010, with only 4 Driver Faults (minors) After having Driving Lessons with Bordon Think Driving School Instructor Ian Weir. Well Done Hollie! 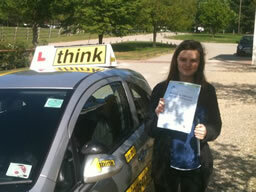 Tabby from Petersfield, PASSED FIRST TIME at Winchester test centre on December 9th 2010, and only 5 Driver Faults (minors)! After having Driving Lessons with Bordon Think Driving School Instructor Ian Weir. Well Done Tabby! 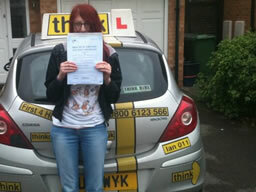 Tabby was recommended to Think Driving School from a friend who had already passed their driving test with Ian Weir from Think Driving School. 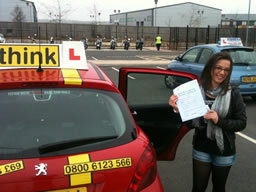 Rachel from Bordon (Lindford), PASSED FIRST TIME at Farnborough/Aldershot test centre on December 6th 2010, and only 3 Driver Faults (minors)! After having Driving Lessons with Bordon Think Driving School Instructor Ian Weir. Well Done Rachel! 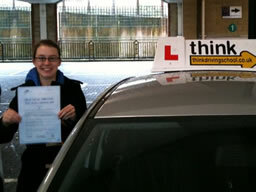 Rachel was recommended to Think Driving School from a friend who had already passed their driving test with Ian Weir from Think Driving School. 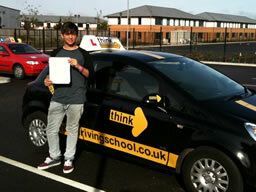 After having Driving Lessons with Guildford Think Driving School Instructor Ross Dunton. Well Done Joseph! 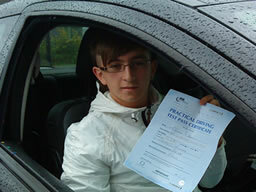 Aaron from Headley, PASSED FIRST TIME at Farnborough test centre on November 29th 2010. with just 3 Driver Faults (minors) After having driving lessons with Bordon think driving school instructor Jamie Johnson. Well done Aaron! 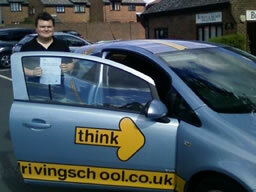 After having Driving Lessons with Guildford Think Driving School Instructor Ross Dunton. Well Done James! James was recommended to Think Driving School from his Friend who had already passed their driving test with Ross Dunton from Think Driving School. 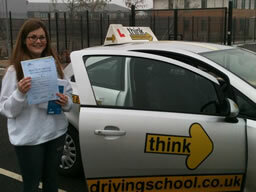 Lauren from Mychett, PASSED at Farnborough/Aldershot test centre on November 26th 2010, with only 5 Driver Faults (minors) After having Driving Lessons with Bordon Think Driving School Instructor Ian Weir. Well Done Lauren! 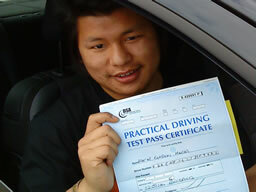 Aaron from Headley Down, PASSED FIRST TIME at Guildford test centre on November 24th 2010, with only 4 Driver Faults (minors) After having Driving Lessons with Bordon Think Driving School Instructor Ian Weir. Well Done Aaron! Aaron was recommended to Think Driving School from his brother who had already passed their driving test with Bordon based Ian Weir from Think Driving School a couple of years ago. After having Driving Lessons with Bordon Think Driving School Instructor Doug Edwards. Well Done Dan! 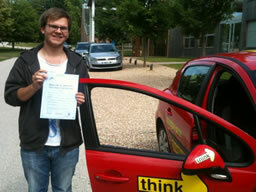 After having Driving Lessons with Guildford Think Driving School Instructor Ross Dunton. Well Done Olasvnkani! 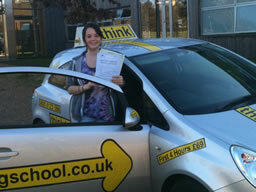 Kelly from Petersfield, PASSED FIRST TIME at Farnborough/Aldershot test centre on November 10th 2010, with only 7 Driver Faults (minors) After having Driving Lessons with Bordon Think Driving School Instructor Ian Weir. Well Done Kelly! 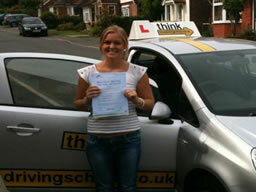 Lucy from Haslemere, PASSED FIRST TIME on November 8th 2010. with just 7 Driver Faults (minors) After having driving lessons with Bordon think driving school instructor Jamie Johnson. Well done Lucy! 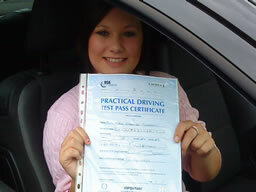 Jess from Aldershot , PASSED FIRST TIME at Farnborough/Aldershot test centre on November 8th 2010, with just 3 Driver Faults (minors) After having driving lessons with Aldershot think driving school instructor Stuart Webb, Well done Jess! 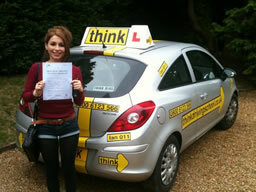 Sala from Liphook, PASSED at Portsmouth test centre on November 6th 2010, with only 7 Driver Faults (minors) After having driving lessons with Bordon think driving school instructor Doug Edwards, Well done Sala! 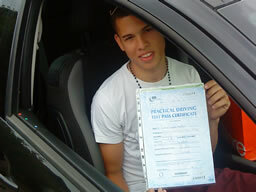 Sala was recommended to Think Driving School from his Friend who had already passed their driving test with Doug Edwards from Think Driving School. After having Driving Lessons with Bordon Think Driving School Instructor Ian Weir. Well Done Megan! 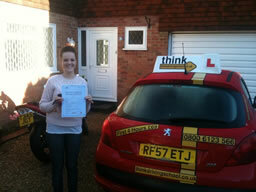 Megan was recommended to Think Driving School from a friend who had already passed their driving test with Bordon based Ian Weir from Think Driving School. After having Driving Lessons with Bordon Think Driving School Instructor Doug Edwards. Well Done Ell's! Ell's was recommended to Think Driving School from his Friend who had already passed their driving test with Doug Edwards from Think Driving School. After having Driving Lessons with Bordon Think Driving School Instructor Doug Edwards. Well Done Alan! After having Driving Lessons with Bordon Think Driving School Instructor Doug Edwards. Well Done Lil! Lil was recommended to Think Driving School from his Friend who had already passed their driving test with Doug Edwards from Think Driving School. 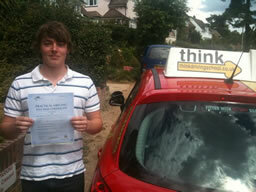 After having Driving Lessons with Guildford Think Driving School Instructor Ross Dunton. Well Done Callum! After having Driving Lessons with Bordon Think Driving School Instructor Doug Edwards. Well Done Paul! Paul was recommended to Think Driving School from his Friend who had already passed their driving test with Doug Edwards from Think Driving School. 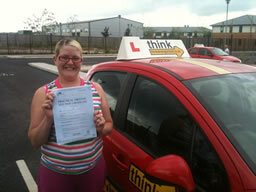 Kathryn from Liss (40), PASSED at Portsmouth test centre on October 12th 2010, with only 8 Driver Faults (minors)! Well done Kathryn! After having Driving Lessons with Bordon Think Driving School Instructor Doug Edwards. Well Done Kathryn! Kathryn was recommended to Think Driving School from his Friend who had already passed their driving test with Doug Edwards from Think Driving School. 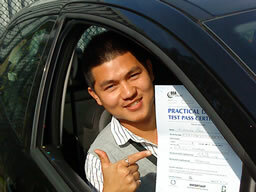 Jay from Aldershot, PASSED FIRST TIME at Farnborough/Aldershot test centre on October 11th 2010, . Well done Jay! 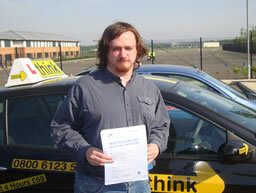 After having Driving Lessons with Aldershot Think Driving School Instructor Stuart Webb. Well Done Jay! 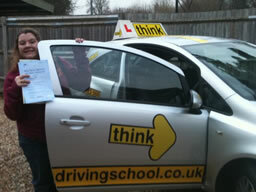 Kerry from Bordon (lindford), PASSED at Farnborough/Aldershot test centre on October 11th 2010, with just 6 Driver Faults (minors) Well done Kerry! After having Driving Lessons with Bordon Think Driving School Instructor Doug Edwards. Well Done Kerry! 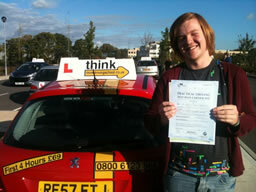 Edward from Liss, PASSED FIRST TIME at Chichester test centre on October 4th 2010, and only 2 Driver Faults (minors)! After having Driving Lessons with Bordon Think Driving School Instructor Ian Weir. Well Done Edd!! Edd was recommended to Think Driving School from a friend who was already learning with Bordon based Ian Weir from Think Driving School. 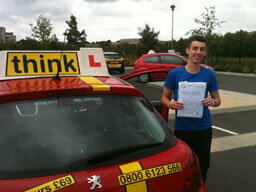 Billy from Aldershot, PASSED FIRST TIMEat Farnborough/Aldershot test centre on September 30th 2010, and only 4 Driver Faults (minors)! 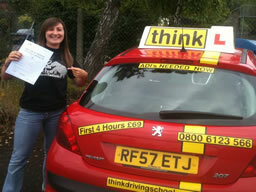 After having Driving Lessons with Aldershot Think Driving School Instructor Stuart Webb. Well Done Billy!! 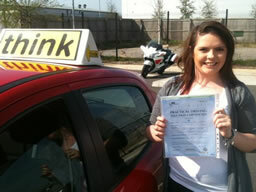 Rachel from Petersfield, PASSED FIRST TIME at Portsmouth test centre on September 23rd 2010, and only 4 Driver Faults (minors)! After having Driving Lessons with Bordon Think Driving School Instructor Doug Edwardss. Well Done Rachel!! 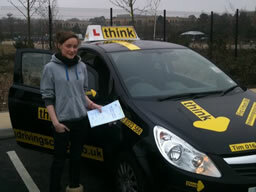 Rachel was recommended to Think Driving School from his Friend who had already passed their driving test with Doug Edwards from Think Driving School. 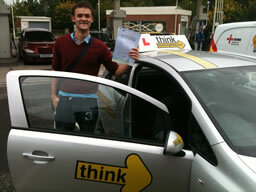 Daniel from Hindhead, PASSED FIRST TIME at Farnborough/Aldershot test centre on September 22nd 2010, and only 7 Driver Faults (minors)! After having Driving Lessons with Bordon Think Driving School Instructor Doug Edwards. Well Done Daniel!! 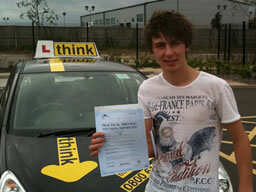 Harry from Liss, PASSED at Farnborough/Aldershot test centre on September 16th 2010, and only 3 Driver Faults (minors)! 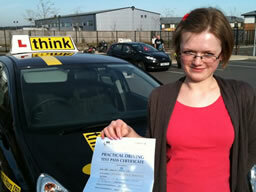 After having Driving Lessons with Think Driving School Instructor Stuart Webb. Well Done Harry!! After having Driving Lessons with Bordon Think Driving School Instructor Doug Edwards. Well Done Jenifer!! After having Driving Lessons with Bordon Think Driving School Instructor Doug Edwards. Well Done Mark! 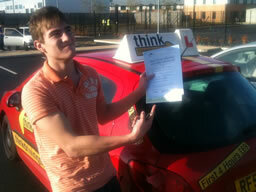 Joe from Bordon, PASSED at Farnborough/Aldershot test centre on September 7th 2010, and only 4 Driver Faults (minors)! After having Driving Lessons with Bordon Think Driving School Instructor Doug Edwards. Well Done Joe!! 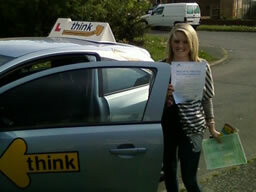 Emma from Bordon, PASSED FIRST TIME at Farnborough/Aldershot test centre on September 1st 2010, and only 2 Driver Faults (minors)! 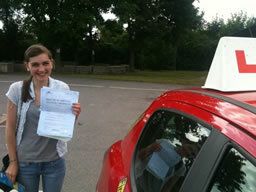 Abby from Yatley, PASSED FIRST TIME at Farnborough/Aldershot test centre on August 24th 2010, and only 6 Driver Faults (minors)! 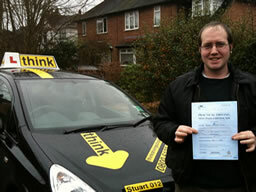 After having Intensive Driving Lessons with Aldershot Think Driving School Instructor Stuart Webb. Well Done Abby! 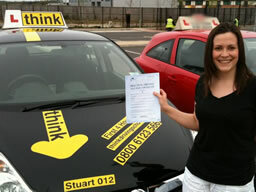 Christina from Bordon, PASSED at Farnborough/Aldershot test centre on August 18th 2010, and only 6 Driver Faults (minors)! After having Driving Lessons with Bordon Think Driving School Instructor Doug Edwards. Well Done Christina! 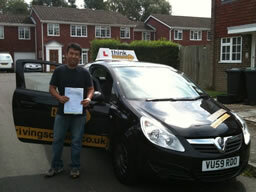 Abner from Bordon, PASSED FIRST TIME at Farnborough/Aldershot test centre on August 11th 2010, with THINK and only 1 Driver Faults (minors)! 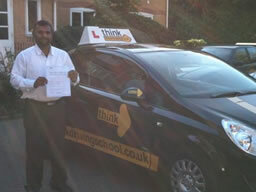 After having Driving Lessons with another school (failed 3 times) Abner Passed with Think Driving School Instructor Stuart Webb. Well Done Abner! 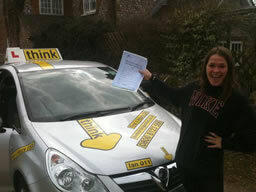 Zoe from Haslemere, PASSED FIRST TIME at Guildford test centre on August 9th 2010, FIRST TIME and only 2 Driver Faults (minors)! After having Driving Lessons with Bordon Think Driving School Instructor Ian Weir. Well Done Zoe! 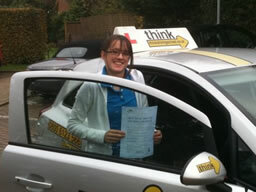 Zoe was recommended to Think Driving School from a friend who had already passed their driving test with Bordon based Ian Weir from Think Driving School. 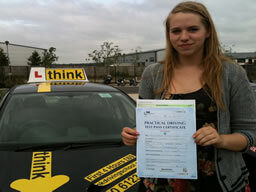 Hannah from Bordon, also PASSED at Farnborough/Aldershot test centre on August 5th 2010, FIRST TIME and only 6 Driver Faults (minors)! 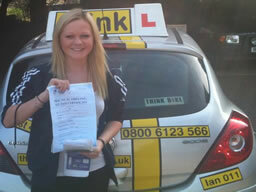 Hannah was recommended to Think Driving School from a friend who had already passed their driving test with Bordon based Ian Weir from Think Driving School. 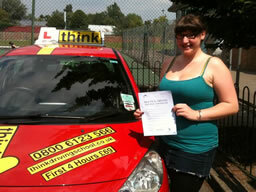 Leanne from Bordon, PASSED at Farnborough/Aldershot test centre on August 5th 2010, FIRST TIME and only 2 Driver Faults (minors)! After having Driving Lessons with Think Driving School Instructor Ian Weir. Well Done Leanne! 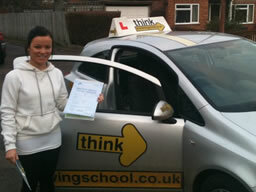 Leanna was recommended to Think Driving School from a friend who had already passed their driving test with Bordon based Ian Weir from Think Driving School. 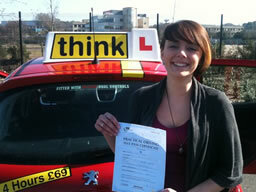 Tristen from Petersfield, PASSED at Winchester test centre on August 4th 2010, and only 6 Driver Faults (minors)! 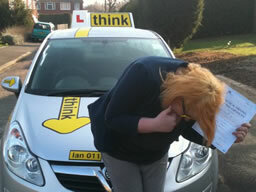 After having Driving Lessons with Think Driving School Instructor Ian Weir. Well Done Tristen! 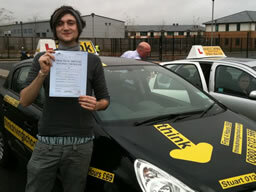 Thomas from Farnham (20), PASSED at Farnborough/Aldershot test centre on August 2nd 2010, FIRST TIME and only 4 Driver Faults (minors)! After having Driving Lessons with Bordon Think Driving School Instructor Doug Edwards. Well Done Thomas! After having Driving Lessons with Bordon Think Driving School Instructor Doug Edwards. 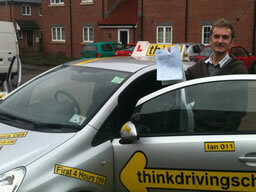 After having Driving Lessons with Farnham Think Driving School Instructor Ian Weir. 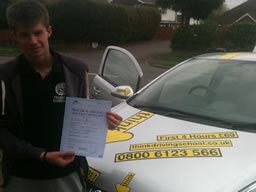 Callum was recommended to Think Driving School from a friend who had already passed their driving test with Bordon based Ian Weir from Think Driving School. Elisa was recommended to Think Driving School from a friend who was already learning with Bordon based Ian Weir from Think Driving School. 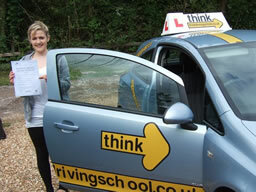 Chloe was recommended to Think Driving School from a friend who had already passed their driving test with Bordon based Ian Weir from Think Driving School. Micheal was recommended to Think Driving School from a friend who was already learning with Bordon based Ian Weir from Think Driving School. Jo was recommended to Think Driving School from a friend who was already learning with Bordon based Ian Weir from Think Driving School. Luci was recommended to Think Driving School from a friend who was already learning with Bordon based Ian Weir from Think Driving School. Sarah was recommended to Think Driving School from a friend who was already learning with Bordon based Ian Weir from Think Driving School. Marissa was recommended to Think Driving School from a friend who was already learning with Bordon based Ian Weir from Think Driving School. After having Driving Lessons with Think Driving School Instructor Doug edwards.